Here’s a sobering fact. At some point in your cat’s life, they will experience a life-threatening emergency – what I like to call CATastrophes. You don’t know when it will happen, but it will happen. And it will probably happen in the middle of the night. When your family veterinarian isn’t available. So, you’ll need to head to your local veterinary emergency room. But knowing what is and isn’t an emergency isn’t always straightforward. So, this week’s post provides information about specific situations that necessitate immediate veterinary medical attention. Happy reading! Cats do a great job of masking illness. For this reason, sometimes it isn’t obvious when there’s a problem. In the wild, cats are pride animals, and some of those natural instincts survived domestication. Within every pride there’s a hierarchy. Somebody is the alpha, and somebody is the omega. In your home pride, your cat sees you as the alpha, so they don’t want to appear weak in front of you. On some level, they think they’re going to get booted from the pride (of course, we know that would never happen!). How does this perception manifest? Cats hide. They stay under the bed. They hole up in a closet. Out of sight, out of mind. Not every cat who hides is having trouble breathing but hiding cats may have a serious health condition that would benefit from veterinary attention. Resting respiratory rate – measure the number of breaths a cat takes in 15 seconds. Multiply the number by 4. If the product is more than 50, you should take your cat the closest veterinarian as quickly and as safely as possible, especially if their gums and/or tongue turns a shade of blue/purple (called cyanosis). Nostril flaring – Watch your cat breathe. Pay particular attention to their nose. If you can see their nostrils flaring, that’s a big red flag. Nostril flaring often means a cat is working too hard to breathe. Immediate veterinary medical attention is indicated. Sitting in unusual positions – When you’re having trouble breathing, it’s often more comfortable to sit in a specific position. For example, when you’re congested, sitting with your head propped up on a lot of pillows often provides some relief. Sometimes sitting in a specific posture is more comfortable for cats having difficulty breathing. This phenomenon is called orthopnea. A classis example of orthopnea in cats is when they sit with their elbows abducted or away from the body wall. 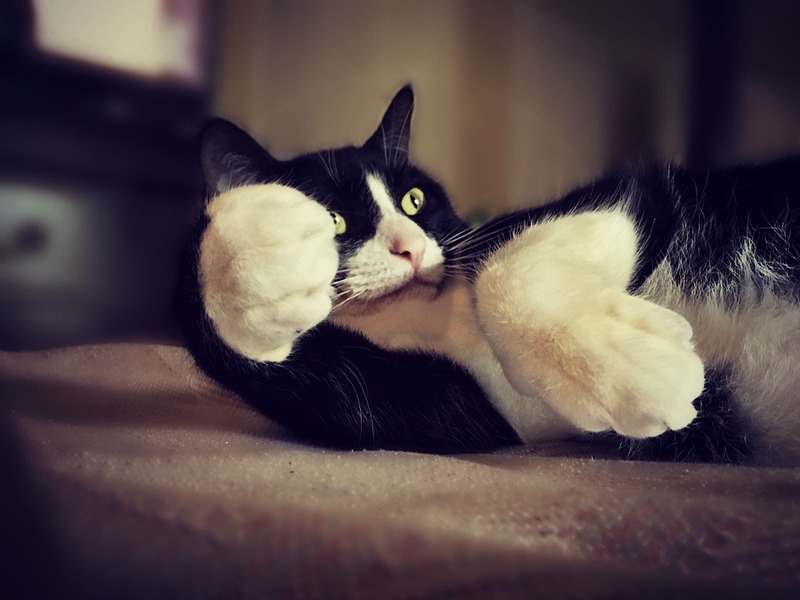 If you see your cat sitting in an abnormal position, they may be having trouble breathing and benefit from expedient medical care. A cat sitting up on their front paws with the elbows abducted or moved away from the chest wall. 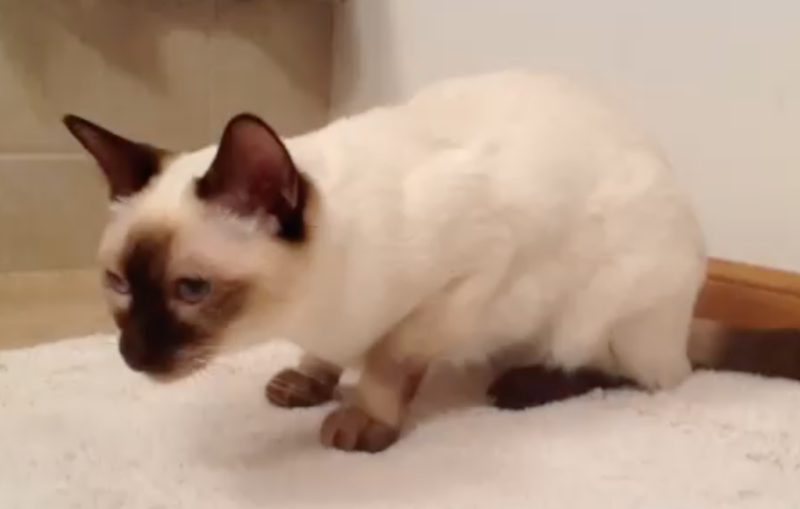 When a cat can’t pee, time is of the essence. Urethral obstruction is a quintessential emergency, and immediate veterinary intervention is needed. If the obstruction is not relieved in a timely manner, the urinary bladder could rupture, and the kidneys can be permanently damaged. Indeed, a cat with a urethral obstruction will die without medical intervention. But, here’s the good news. With timely care, cats with urethral obstruction can make a complete recovery. So, don’t ignore the signs. Get your cat to a veterinarian ASAP if they’re having trouble urinating! It can be very scary for a pet parent to find their cat acutely unable to use their back legs. There are many possible reasons, including orthopedic conditions, neurologic problems, and weakness due to vital organ dysfunction. Most pet parents will be able to readily recognize a broken leg, Neurologic problems can be challenging, but sometimes looking at the eyes can be helpful. Pupils of different sizes and/or eyes that move abnormally are strongly suggestive of a nervous system disorder. When a pet parent brings a cat into my emergency room because of an acute inability to use the pelvic limbs, the first thing that crosses my mind is a problem called feline arterial thromboembolism or FATE. You can read more about this problem here. A thrombus is a blood clot. When the blood clot travels in the bloodstream and ultimately becomes lodged in a vessel, it’s said to have embolized the vessel. So, an arterial thromboembolus is a blood clot that has become lodged in an artery, obstructing blood flow. The most common location for this to happen in a cat’s body is the last portion of the aorta (major artery in the body), an area referred to as the saddle. Indeed, the lay term for arterial thromboembolism is saddle thrombus. Cats living with FATE are extremely painful and often scared and anxious. They vocalize. They cry. They sometimes yowl and scream. They attempt to drag themselves around with their functioning front limbs. They don’t know why they can’t walk, and the lack of proper blood flow to their limbs creates tremendous discomfort. These cats truly need immediate emergency care. In times past, veterinarians were essentially taught the most humane course of action for FATE cats was humane euthanasia. Sadly, even today, many veterinarians still recommend euthanasia for these patients without even trying to help them. Thankfully, medicine has advanced. With aggressive and timely intervention, FATE cats can make a meaningful recovery. They can return home to their families and lead quality lives. Not every cat survives, but I would argue attempting life-saving interventions is definitely worth it! Cats are curious critters. As the saying goes, their curiosity sometimes kills them. But, the vast majority of the time, it usually only causes injuries. Of course, some of these injuries can be quite serious and life-threatening without prompt veterinary care. Some common traumas seen in cats are motor vehicle accidents, falls from heights (i.e. : high-rise syndrome), animal attacks, and sadly, abuse by humans. It should go without saying that cats that have been traumatized should be evaluated by a veterinarian as soon as possible. If you suspect or know your cat has been exposed to a toxin chemical or substance, please seek immediate veterinary medical attention for them. Pet parents may find it helpful to contact the ASPCA Animal Poison Control Center. For a nominal fee, you can speak with a veterinary toxicology expert for initial advice. If your pet does require veterinary care, your pet’s doctor can subsequently speak with the toxicologist to help ensure your pet receives the best possible care. When you bring your pet to the veterinary hospital for care, please remember to bring the package that contained the toxin – the information contained on the packaging can be very helpful to your pet’s healthcare team! When/if one of these situations happen, a cat should be evaluated by a veterinarian immediately. Medical emergencies – so called CATastrophes – with our cats happen. That is a relative inevitability. So, pet parents need to be as prepared as possible. The best way to avoid an emergency? Follow the preventative healthcare recommendations of your family veterinarian.